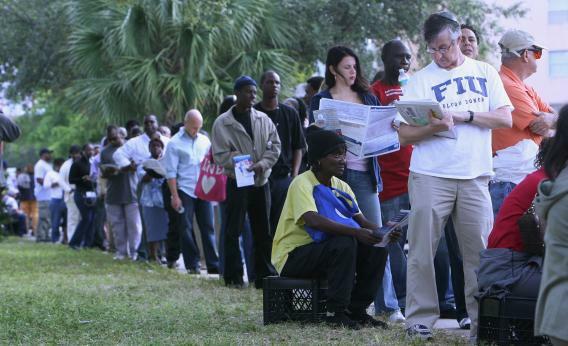 Residents line up to cast their vote in the 2008 Presidential Election outside the North Miami Public Library October 30, 2008 in Miami, Florida. HEMMER: They held her up as a victim! What was she the victim of? Rashes on the bottom of her feet? Ha, ha, rashes! Seriously, that’s sociopathic, and anyone who takes five or six seconds to examine the issue learns that 1) voting lines were asymmetrically longer in black and Hispanic precincts than in white precincts, 2) at least 200,000 Floridians gave up on voting last year because the lines were too long. Queuether (n): One who doubts that long voting lines cause problems for anybody and that there’s any need to reform them.